Daddy-Daughter Monster Drawing Day, plus MUNCHKIN: The Book! Apparently, I missed “Take Your Daughter to Work Day” this year. 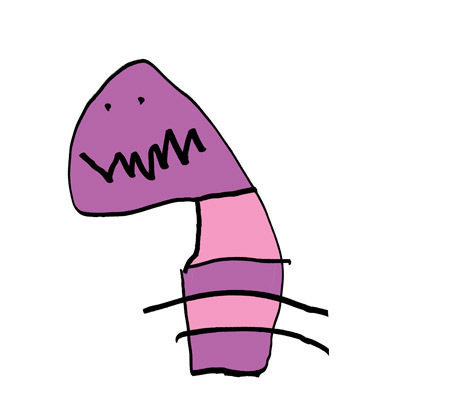 Still, “Can I be a cartoonist when I grow up?” Daughter, Age 4, will sometimes ask. Making me wonder where I failed as a parent. That said, those times we get to draw something together are truly ones that I cherish. Take the drawing of hers below, for example. James Stowe, of Sidekick Quests fame, offered us the chance to contribute a piece to his Fiendish Fan-Made Friday feature. Which I leapt at. I mean, look, I’m not kidding: I think Fiendish Fan-Made Friday is one of the coolest, sweetest things online. And I, using the exact same pen she did (MAN, that kid can put pressure on a nib), came up with this. Call the top one the “young” version, and the lower one the “adult.” What do they do? How will they be used? Tune in to James’ Fiendish Fan-Made Friday this coming Friday, and find out! EDIT: Daughter’s monster is now up! I’m such a proud dada! It’s a question I get asked. A lot. I’ve never actually answered the question directly. Indeed, it’s well-nigh impossible. I’ve drawn more than 4,000 Munchkin cards, and choosing a single favorite just makes my brain hurt. 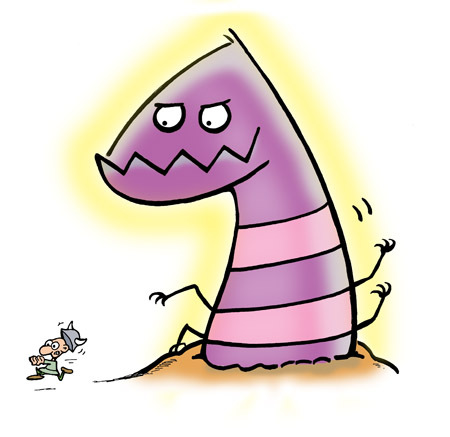 I mean, even worse than some of Munchkin Tzar Andrew Hackard’s puns. But last year, my pal James Lowder gave me the chance to choose a few of my favorite Munchkin cards from every core set I’ve worked on. And this autumn, that essay, along with many others, from a stellar list of contributors, will be published in THE MUNCHKIN BOOK, from Smart Pop Books. Steve Jackson will be contributing. Andrew Hackard will be contributing. Monica Valentinelli; Joseph Scrimshaw; Matt Forbeck; Dave Banks; Bonnie Burton; Jennifer Steen…hells teeth, even LIAM FREAKING McINTYRE is onboard It’s like a giant ice-cream sundae of awesome by my cool geeky pals, CAPPED OFF WITH A HEAPING HELPING OF SPARTACUS SAUCE! Oh, dear. I’m sorry about the phrase “Spartacus Sauce” there. Truly, I am. I also did the cover, as you can probably tell. Click here or on the above image for the large version. 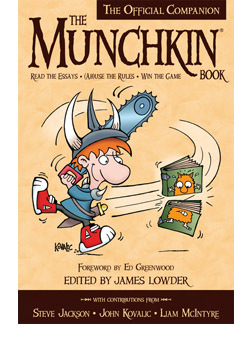 Anyway, I couldn’t be happier to be a contributor to the Munchkin Book. Look for it this Autumn. “Read the Essays; Abuse the Rules; Win the game” indeed. And finally find out once and for all…which cards are my favorites! In the meantime, here’s the full press release from Smart Pop. By gently—and sometimes not so gently—mocking the fantasy dungeon crawl and the sacred cows of pop culture, the Munchkin® card game has stabbed and sneaked and snickered its way to the pinnacle of success. Along the way, its sold millions of copies, been translated around the world, and spawned more than two-dozen sequels and supplements. Steve Jackson Games, based in Austin, Texas, has been publishing games, game books, and magazines since 1980. 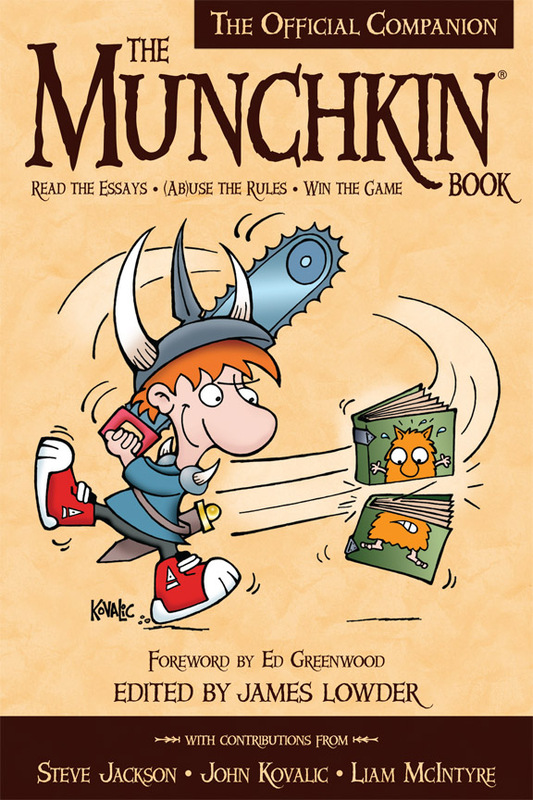 Its best-selling game is Munchkin, with well over 2 million copies of the games and supplements in print worldwide. Other top sellers are GURPS (the Generic Universal RolePlaying System), Zombie Dice, and Illuminati. Past hits have included Car Wars and Toon. Steve’s very first game, Ogre, recently drew almost a million dollars’ worth of Kickstarter support for a super-deluxe edition to be released in 2013.